EngagingPatients.org Community Health Workers – Empowering the Most Vulnerable Patients - Welcome to EngagingPatients.org! It is no secret that building trusting relationships and empowering patients to participate in their health results in better outcomes and care coordination. But, it isn’t always easy, especially for some of our most vulnerable patients—those deemed high risk because of complex medical challenges, immigrants and refugees with a history of trauma or patients struggling with mental health and/or substance use issues. The Massachusetts General Hospital is a large academic medical center located in the heart of Boston. The hospital’s commitment to patient care, research and teaching is legendary but not so well known is our longstanding dedication to the poor and underserved. MGH is invested in improving the health of its surrounding communities, with a particular commitment to those living in local areas where we have operated community health centers for nearly 50 years. In each of these communities, increasingly diverse populations contribute to the vitality of the neighborhoods. There are substantial challenges, however, including high rates of poverty and low educational attainment along with a disproportionate burden of substance use, violence and obesity. The City of Chelsea, just outside of Boston, is a gateway community for many new refugees and immigrants. Populations include adults and children from Central and South America and Puerto Rico, Africa (particularly Somalia), Bosnia, Iran, Afghanistan, Brazil, Nepal, Eretria and Haiti. These patients and families struggle with barriers to care because of language, socioeconomic status, alien status, isolation and many are uninsured. Their situations may be further complicated by extreme poverty, trauma and distrust of government and institutions. Our Community Health Workers (CHWs) work on the frontlines with vulnerable patients to help them identify and address barriers to health and health care, whether those barriers are navigating the health care system or resolving a housing crisis. We currently employ 45 CHWs from 25 countries who speak 21 languages. 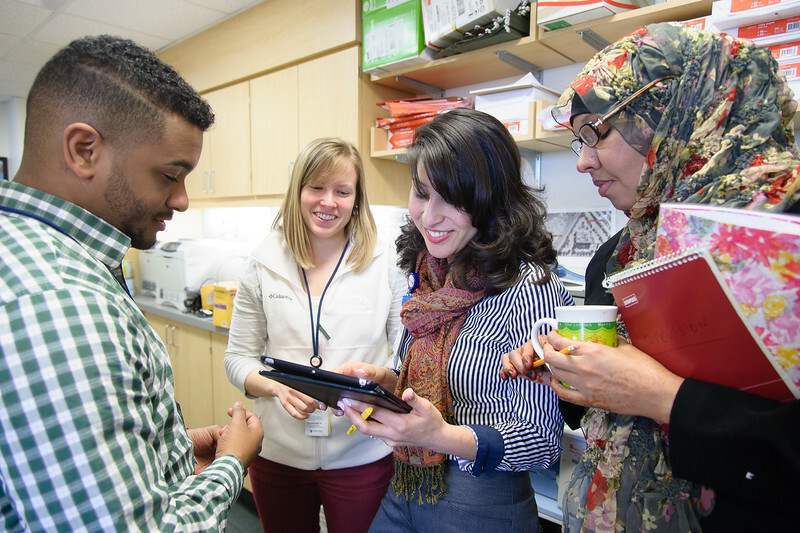 They include cancer navigators who make sure patients receive potentially life-saving screenings and diagnostic care; home visitors for vulnerable, high-risk new mothers; violence prevention advocates for victims of domestic or street violence; recovery coaches for those with a substance use disorder; and refugee health coordinators. Over time, CHWs build trusting relationships with patients to bridge the various cultural, language and social barriers to accessing health care resources. The key to this work is starting from a place of respect and honoring the patient’s journey. These health professionals may possess a common culture and language with their patients but it is the shared life experience that helps to break down the barriers and build the trust. These “guides” can function as the eyes and ears into the patient where a nurse or doctor cannot go. A patient may be told by a physician that she needs to exercise because of her obesity and the danger of developing Type 2 diabetes. That patient may be feeling isolated and afraid, living in a neighborhood too dangerous to walk outside. As a full-fledged member of the healthcare team, the CHW might try and find out what the patient likes to do. Maybe she enjoys dancing? Maybe she likes to listen to music from her native country? Dancing in her apartment for 10 minutes or more per day may be just wh at this patient needs to begin dealing with her obesity. Small, manageable steps can be the starting point toward reaching the larger goal of losing weight. e reinforcing the skills that they will need down the road–finding the right office, knowing how to access an interpreter or learning how to take public transportation. There is a strong educational component to the work. We do a lot of teaching about why things are important–regular mammography, vaccines, adhering to medications and attending routine and specialty appointments. We also help patients tap into their own natural support systems (neighbors, friends, family members) and connect them to other resources. The ultimate goal is to empower our patients and families to engage in their own healthcare. 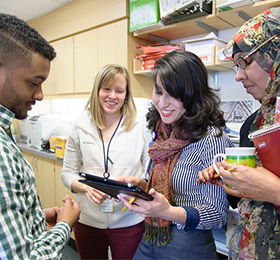 For our most vulnerable, professional Community Health Workers often are the bridge that makes the critical difference in improving health outcomes by working to address the underlying social determinants of health–trauma, food insecurity, housing, literacy, language barriers, family and community safety, diet, exercise and more. Sarah Abernethy Oo is director, Community Health Improvement for Chelsea HealthCare Center at Massachusetts General Hospital Since 1997, Sarah has worked to bring health care equity to the patients at the MGH Chelsea HealthCare Center. She leads a team of 45 staff community health workers who implement programs and strategies targeting immigrant and refugee health and social services, family and community violence, hunger, and cancer prevention. Sarah has had extensive experience working with underserved communities both in the United States and overseas. Immediately prior to joining MGH Chelsea, Sarah worked as a Health Program Officer for UNICEF in Bangladesh She holds a Masters of Social Work from Columbia University.